At school I was a sprinter and loathed cross-country runs. In my low 20s (and sporadically thereafter) I tried jogging which I found a) boring and b) gave me shin splints. To address the shin splints I went to specialist running shops and was given heavy pronation (anti-pronation?) shoes - but promptly got injured again. Many years later I am still struggling to run any distance. For the second walk/run I went out with my wife, who runs 3 times a week. This was a mistake - pushed a bit too far and had terrible Achilles pains the next day. And basically that meant walking only for 4 months - every attempt to run triggered the Achilles again. I now have 2 pairs of these: blue canvas and black leather. Both very nice and usable at the office. I had to "sugru" the inner heel of the canvas pair as they chafed a little. So now I get to gently stretch my achilles for hours a day. Right now I am going back to walk/running (60-90second run, 3 minute walk) - so far so good. 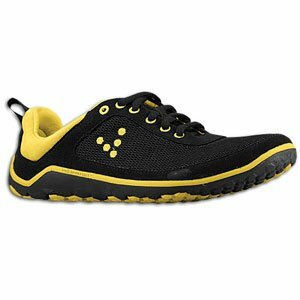 To do that over the winter I got a pair of Vivobarefoot Trails which I use when walking the dog. Again excellent: nice broad toe box, more traction, highly waterproof (which surprised me). I my look at some Breathos if summer ever arrives. A distinctive design! I find them comfortable but I have not used them much yet! Again a summer shoe. I have assembled them, and learned to tie them - which was fun. Getting the tension right is a bit of an art but I think I am there now. As with the Achilles I look forward to more sunshine! Transition carefully! I have found being able to wear minimalist shoes at work and mainly walking to be a great way of training my feet. This is especially important for the older ones, and those who do a lot of running miles in heavy-weight running shoes. You don't have to have the 5 fingers! Vivobarefoot and others make relatively normal looking shoes (Achilles excepted) which are easier to fit and can cut down on one form of injury. That said many people love VFFs. The minimalist shoe community is great. So hopefully this will be the summer where I complete my transition to minimalist running and not just walking - I'll let you know! So a slightly belated write-up of my Saturday jaunt up to the Big Smoke. Just so you know, I really use Emacs mainly for org-mode but I am also playing with Common Lisp ( is slime/swank) and Clojure (via nrepl). I am not a power user, and have not done any elisp except twiddling with init.el. Did it meet those expectations (except the last! ): yes, and more! I can claim another first - never been to Mornington Crescent tube station ( which is just north of London's Euston (main station for the North of the UK). The venue ( 2nd Floor, Centro 3) belonged to Forward and was great: auditorium, canteen area with a plentiful supply of beverages. A big shout out to them and @Jon_Neale in particular for supporting this conference. There were issues with the streaming so not all talks were recorded for posterity; there is an explanation here. As someone said on that thread - this was a free conference done by a first-time organising team, so these things happen... That said people are pulling together with audio, video from phones, and (obviously) the side decks ( or org files!) etc.- all is not lost! Alex Simic (+Aleksandar Simic) led the organising team and was the MC. This was the worst case for me so far of meeting people who I have seen on vimeo/you tube, read on Twitter/G+/blogs etc. but you have never spoken to before. I felt I knew them, they wondered who I was. Luckily nearly everyone was very approachable so I felt they were best buddies by the time I left. Sacha Chua and John Wiegley did a joint Keynote. Sacha did a a fantastic "Why Emacs is so great" presentation to an emacs conference - everyone loved it and everyone around where I was seemed to learn something new from it; no mean feat to 100 emacs experts (well, 99). Sacha is a person of boundless enthusiasm! John did a history of Emacs and its antecedents together with personal anecdotes of his own. Sounds as if it would be a dry topic but I learned some new stuff and he delivered it in an amusing and engaging way. A great start to the conference! Nic Ferrier talked in his usual entertaining and unique style about loads of stuff: emacswiki, elnode, the nature of lazy collaboration and more! Oh and he used org mode for his notes. Dimitri Fontaine spoke about el-get which is the package system I tend to use as a preference - partly because I found it first, it worked on Emacs 23 and it can use other package systems as methods. Dimitri, Nic and Steve ("Luna Sandles") Purcell also gave an interesting panel on package managers and resisted over complicating the domain! Sam Aaron talked about emacs-live (pointer to foundation packages). As one of the oldest people there I needed to get home for an early bedtime, so I missed his emacs driven music performance (with free beer and pizza!) later on. But really there is almost too much to mention (sorry if you didn't get an explicit mention) - a very good day! I am a great fan of both +VIVOBAREFOOT and +sugru . I will write more on my experiences with minimalist shoes, but I have now acquired a number of pairs of Vivobarefoot's shoes and love all of them. The one problem pair were the Vivobarefoot Ra (Blue, canvas) - look good, can be worn to work(although the white sole is definitely "business casual"), but after a while the heel rubbed on the edge. I am happy to report that a "smear" of blue sugru around the rear edge of the shoe seems to have done the trick; it was tested by the local Xmas disco! Hilarious and insightful! Personally I think it will be some form of octopus that inherits the earth, but tellingly a mutated version of the last line will still apply.